I think this statement short-changes the nasty sentiment between Bud Adams and the fans of Houston that existed when the Oilers left. Adams was vilified in Houston for years before he left town, and I think his mere presence is a big reason why Houston wouldn't vote for a new stadium before the Oilers left. And I'm not sticking up for Adams because I think the fans of Houston were justified in any bad feelings they had for Adams. He demanded the Astrodome scoreboard be torn down for football seats in 1988 or he would move the team to Jacksonville. The Dome got renovated (completely stripped of character once the scoreboard was replaced), and then Adams started squawking about needing a new stadium. He was persona non grata by Houston fans by the mid-90s. I don't know how his family feels about how Adams was treated and whether they feel like he brought a lot of that on himself (he did). But based on his daughter's brief and blunt comment that included a "no" when she was asked about the Texans wearing Oilers colors, I think it's safe to say there is still some bad blood there. And that's why I'm not surprised the Titans would have issues with the Texans wearing OIlers colors. 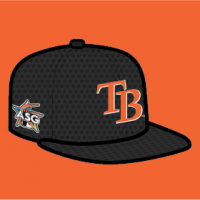 As an Astros fan, I do not hate this cap, and I prefer it to be worn somewhere with some jersey (home, road, alternate orange jersey, alternate blue jersey, whatever), anywhere instead of all navy, all the time. The Astros have not totally phased out this cap because they wore it in the third game of the season at Tampa Bay (see the photo in the story below). https://www.chron.com/sports/astros/article/Houston-Astros-Tampa-Bay-Rays-McHugh-game-recap-13729403.php But it would be awesome if they stuck with it on the road or at home. I'm a fan of a separate cap for road and home when you don't have a deep uniform tradition. I think it's ridiculous this cap does not have an orange squatchee (the orange cap with the blue bill also does not have a blue squatchee and it should, too). But the lack of match to the bill does not render this cap useless, and I'd prefer to see it more than once a road trip. The Mariners had this for a while above the left-field seats. You can see it's an older picture because of the black Jays flag. But they had an Astros flag group with the rest of the AL West teams when I visited Seattle in 2013. Not sure if the Mariners still do this. I think the name and colors should belong to the city. I grew up in Louisiana as a Jazz fan when they were in New Orleans. To this day, I can't embrace the Pelicans and I couldn't embrace them as the Hornets. Not even the Pelicans' Mardi Gras uniforms can sway me. It's been 40 years, but in my mind, the NBA in New Orleans should be represented with a team named the Jazz wearing Mardi Gras colors. Otherwise, I'd be fine with the Pelicans some day moving to Seattle and being rebranded as the Supersonics. The Oilers' colors and name should have stayed in Houston. Bud Adams was butthurt Houston wouldn't build him a new stadium (never mind they essentially destroyed the Astrodome by ripping out the scoreboard and putting in football seats for him only to leave eight years later). And the NFL let him decide to "retire" the name and colors, which was a travesty. I love this except I'd prefer orange pants with the brown pants, too. I loved the Sipe-era uniforms. I'm sorry, but I'm not a fan. There is almost no color from afar when white and gray/silver are paired together in whatever combo/order you want to pair it. I don't care if the helmet is silver and the pants are silver, I don't like it with a white jersey. Yes, you have to have a white jersey. No, you do not have to pair the white jersey with silver/gray pants just because it's symmetrical. I prefer the Lions' blue pants with the white jerseys because there is at least more of color. 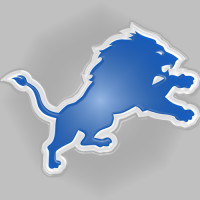 I can tolerate their road look because it's been a traditional look that I associate with the Lions. But it doesn't mean I like it. I think the Patriots' current road uniform is bad because of the side panels, but I like the blue pants a whole lot better than when silver pants were paired with white jerseys in the previous uniform set. And this is why teams should be allowed a second helmet. You could have a dark helmet for your road set that could be the same color as the pants. Then you get symmetry and you get some color. I totally agree. I hate when a team wears gray or silver pants with white jerseys. The Raiders are the exception for me, only because it's a frame-of-reference uniform for me. Take away their long history wearing it, and I would argue it's bad design. I'm so sick of the Saints in all black. It would be great to see it once a year. The other seven times, I'd prefer black jerseys and gold pants at home. The Saints' black pants just need some stripes on them, like the batch from '76 to '85. Make a pair with the same style of striping pattern as the color rush pants have. Those CR white pants are essentially throwbacks to the '76-85 set they wore with the black jerseys. They just added a fleur-de-list to the CR pants on the hip. I'm kind of tired of the single stripe on the gold pants, and I'd like to see those get CR-style stripes on them, too. And I'd like to see stripes come back on the regular white and black jerseys. I could get behind three stripes instead of five, but put something on the sleeves. http://www.gridiron-uniforms.com/GUD/controller/controller.php?action=teams-season&amp;team_id=NO&amp;year=1976 Finally, go back to the original shade of gold while you're at it. This would be the most important change, in my opinion. Even going back to the 2011 shade of gold, I have a bunch of caps and pullovers from the Reebok era, and it's jarring to see the difference between the Reebok gold and Nike's gold, which essentially looks like khaki or beige. That jersey looks better than the Nats' current home jersey. Would love to see that full time. Those are awful. Purple and black together are a mess. The Ravens are a mess, TCU is a mess, Northwestern is a mess, and now the Lakers are a mess. Pick black or pick purple. I'm not a Redskins fan, but I prefer the Redskins in burgundy jerseys at home, preferably with yellow pants though I'd settle for white pants. I did like they wore white jerseys at home to make the Cowboys wear blue, and I can get behind that once a year. While I'm normally a fan of a team wearing colored pants with dark helmets, I have never been able to embrace the Redskins' burgundy pants. I'm not sure why that is (maybe because it's basically all the Redskins wore for about 20+ years), but it's just a tired look to me. I'd prefer the Redskins wearing yellow pants all the time, but I'm sure I'm in the minority. I like the Dodgers' current "alt" road uniforms (they seem to wear those more than the "Los Angeles" version) with just "Dodgers" on it, with no outline. It looked good in the mid-70s, and it looks good now. If anything, they should get rid of the "LA" logo on the sleeve because that's unnecessary. That's the only change I'd make to it.